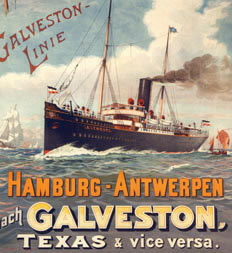 From 1845 to 1924, the Port of Galveston was a major gateway to American immigration. This exhibition wass the first of its kind to explore Galveston’s legacy as a port of entry on a national scale. It brings to light the little-known yet rich era of Galveston’s history and importance to the growth of Texas and the American Midwest. While New York’s Ellis Island’s location made it a natural port for Europeans, Galveston attracted a diverse group of people from Europe, Mexico, South and Central America and even Asia. Before the Civil War, it was a major port for forced migration – the sale and transport of slaves from Africa and other points in the United States to Texas. The exhibit highlights enduring themes in the history of immigration, including: the dangers of the journey; making a life in a new land; navigating bureaucracy; confronting discrimination; and becoming “American.” These trials and tribulations are illuminated through personal stories, dynamic visitor interactive kiosks, engaging media pieces, and more than 200 original artifacts and documents. Forgotten Gateway: Coming to America Through Galveston Island was created and curated by the Bob Bullock Texas State History Museum. Support for this exhibit comes from The National Endowment for the Humanities; Robert J. Kleberg, Jr. & Helen C. Kleberg Foundation; The Cynthia and George Mitchell Foundation; The Summerlee Foundation; Harris and Eliza Kempner Fund; The Moody Foundation; Scurlock Foundation; and Humanities Texas. Local support provided by the Albert and Ethel Herzstein Charitable Foundation.